Are you suffering with Headache, Sinus Pressure and Pain, Stuffiness, Post Nasal Drip? What causes these miserable sinus symptoms? 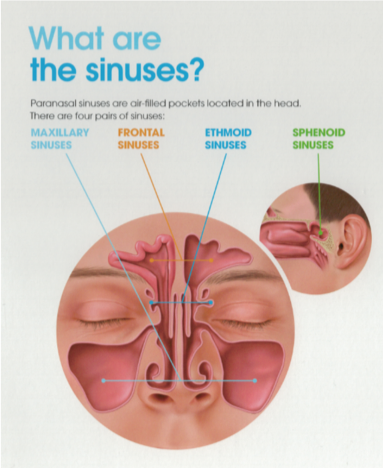 Your sinuses are hollow areas in your skull and are located behind your forehead, cheeks, nose and eyes. These sinus spaces are lined with mucous membranes that help moisten your nasal passages and trap and remove things like bacteria and allergens that you inhale. Healthy sinuses open into your nasal cavity and allow air to circulate and the mucus to drain normally to remove the harmful substances. Sinusitis occurs when swelling and inflammation of your sinus tissues blocks the airflow and drainage. The blockage causes pressure and pain as mucus backs up into your sinuses. You begin to have a persistent headache and nasal congestion. Your ears can feel full, your sense of smell can be affected, and even your upper teeth can become painful. Postnasal drip can cause a sore throat and cough. And then, without normal air circulation and drainage, a stagnant environment develops in the blocked sinuses where bacteria can grow, cause a sinus infection and even more misery with unpleasant greenish-yellow discharge, fatigue, and possibly fever. What can you do about sinusitis? Sinusitis responds in different ways for different people. Most people start with over-the-counter medications and home remedies. If that fails, the sinus sufferer probably visits a doctor for antibiotics. Symptoms of acute sinusitis typically resolve within 30 days. Recurrent sinusitis occurs when you have multiple acute episodes in a year’s time. Chronic sinusitis lasts longer than 3 months and does not resolve with typical medical treatments. You suffer. At this point, you should see a board-certified Ear Nose & Throat specialist (Otolaryngologist), like Dr. Michael Riesberg, for evaluation. 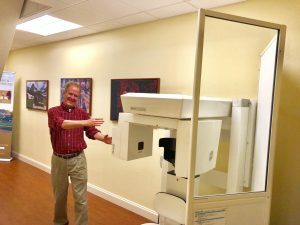 Based on your history, exam and current symptoms, Dr. Riesberg can recommend additional diagnostics as needed, like a CT scan, and the most appropriate treatment. You now have another option to treat Chronic Sinusitis! Historically, the only treatment options left for patients with chronic sinusitis were invasive, rigorous surgical procedures that removed bone and tissue to open sinus passages. The patient faced a hospital visit and expense, post-op discomfort, facial bruising and bleeding, and a weeks-long recovery period. Dr. Michael Riesberg is one of the only Ear Nose & Throat specialists in the region to offer the breakthrough, in-office procedure called Balloon Sinus Dilation (balloon sinuplasty). This advanced, minimally invasive treatment solves the problem of chronic sinusitis at the source. Balloon Sinus Dilation is safe, long-lasting and is done in the comfort and convenience of our office with minimal anesthesia. It allows you to go home after the procedure as soon as you are comfortable. Many patients enjoy immediate relief from sinusitis symptoms and can resume regular activities the very next day. These are the words our sinus patients love to hear from our friendly and welcoming team. When you’re in pain, you don’t need the added agony of waiting days or weeks for a solution. 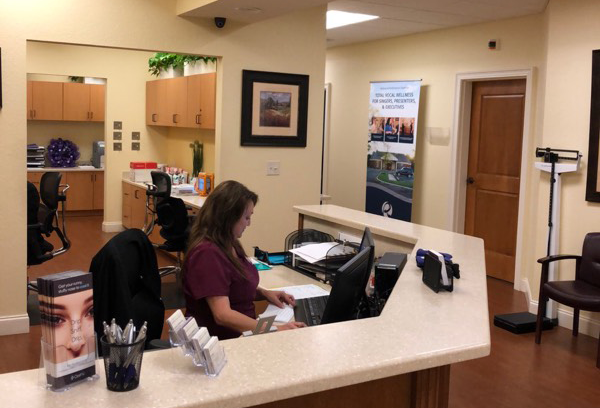 We make it easy to schedule an appointment and receive the care you deserve. If you or a loved one suffers from sinus pain and pressure, Dr. Riesberg and our professional staff want to restore your quality of life at Riesberg Institute, Pensacola’s ear nose and throat destination. Are Your Sinus Symptoms Making You Miserable? Is what you thought was just a cold still hanging on? Did those antibiotics not solve your sinus pressure and drainage? Your symptoms might be due to something more than a cold. You might be struggling with Chronic Sinusitis. Don’t suffer with sinusitis. Find the relief you need!